I will be the first to admit that I am not the right person to talk to all of you about STEM (Science, Technology, Engineering, and Mathematics). I quite literally failed high school chemistry, and I would have failed college calculus were it not for the kindness of a professor who awarded extra credits for "effort." Not kidding. I am smart, sure, but not in a particularly STEM oriented way. That having been said, of course, over this past week I found myself thinking more and more about the media that's gotten me interested in science over the years. Late Saturday night, as I sat hunched over the toilet in our bathroom ruing the fact that I was succumbing to the family gluten allergy*, I took comfort in the fact that I knew pretty clearly what my digestive system was made of. 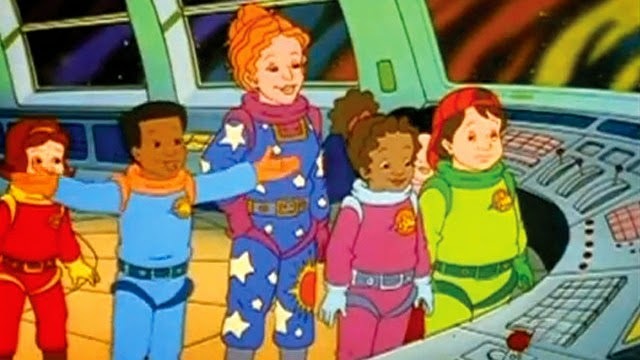 Not because I've ever really studied it, or because I have an abiding interest in my bowels, but because I saw an episode of The Magic School Bus twenty years ago and I still remember how it all works. If that's not success in educational television, I don't know what is. 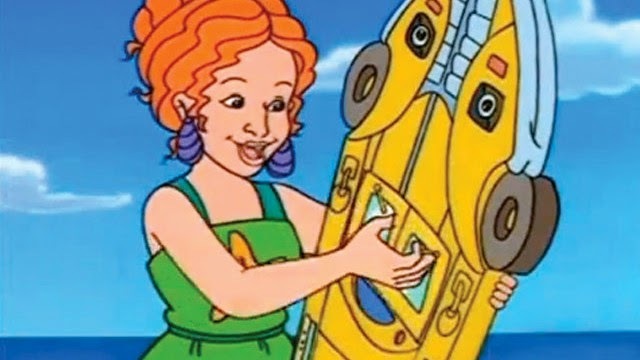 For those of you either too old or too young to remember, The Magic School Bus was both the best and the weirdest offering of educational television in the nineties. It aired from 1994 to 1997 and was singularly responsible for making sure I caught the bus on time every day in fourth grade. If I got the first bus home, I could make it back in time to see the last five minutes of an episode, and that was totally having to sprint. The show, which you can now find on Netflix, much to my glee, has a very simple format that it follows pretty closely. 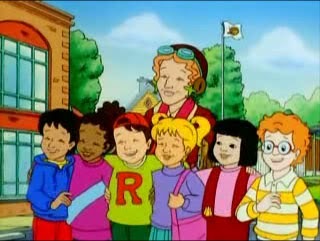 The main characters are the members of Ms. Frizzle's elementary school class - I think it's third grade? - and each episode is structured around a particularly memorable field trip the class takes. Simple, basic, easy. Every week the kids learn about a new aspect of science, and so does the audience. The hook is that the field trips aren't the kind of thing you get to go on every day. 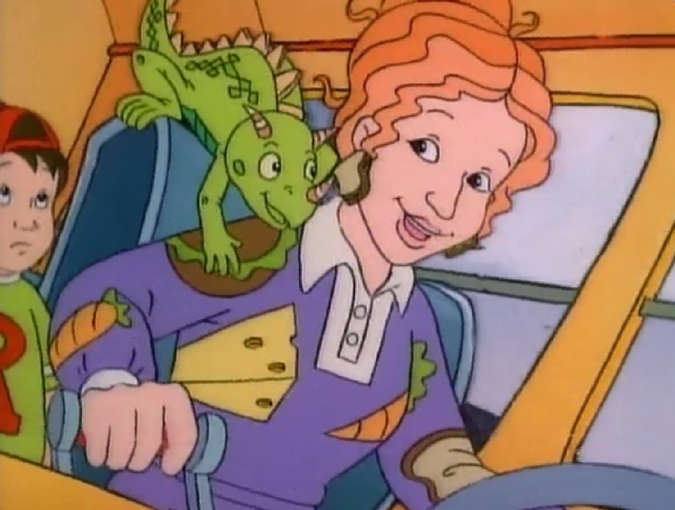 Ms. Frizzle (voiced incomparably by Lily Tomlin) is a magical teacher and she has a magical school bus (also, apparently, a bus driver's license). When she takes the kids on a field trip to learn about the solar system, she doesn't take them to the planetarium, she takes them into space, so that they can bounce around on Mars and float past Saturn. She shrinks the bus down to explore a digestive tract (the episode I was thinking of in that wonderful moment), or she drags them all into an ant hive, or in one memorable instance, she takes them surfing in a volcano. In other words, the trips are completely ludicrous and outrageously awesome. They are exactly the kind of field trips I wish we'd gone on when I was in school. Instead I just got dragged to Plymouth Plantation, Sturbridge Village, and the Salem Witch Trial Museum like every year. Every. Single. Year. More than just wish fulfillment and occasional stretching of reality, though, the episodes actually do a really good job of giving kids a solid understanding of the basics. Yeah, the solar system episode implies that one can actually survive on the surface of Mercury, or even that one could travel the entire solar system in a day. Which is not true. But the episode acknowledges this in an epilogue that features the now adult characters answering viewer questions. And while it is silly and full of wish fulfillment, The Magic School Bus is informative and fun. It tells you things about science that stick with you for years. Decades, in my case. Because the episodes all feature the kids getting out there and experiencing the topic, children watching are far more likely to care about the subject material. The show makes it cool to like science, and that is surely a good thing. Even better, for all that this show is just an excuse to go on awesome science adventures, the writers clearly took time and effort in delineating the characters we would focus on. The cast is diverse, both racially and in gender, with equal numbers of girls and boys, and a very solidly non-white cast. Each kid has their own personality, and those personalities are never stereotypes or offensive or even bad. They're just normal kids. Each kid has his or her own name and defining feature. You've got Arnold, the scaredy-cat, Wanda, the daredevil, Dorothy-Ann, the know-it-all, Ralphie, the jock, Phoebe, the bleeding heart, Carlos, the class clown, Tim, the artist. But even these defining features fail to capture the complexity of the characters. Like, Tim is super artistic, but he's also really snarky. He and Carlos like to tell jokes, but Carlos prefers puns and Tim has a very dry sense of humor. Ralphie is all athletic and sportsy, but he's also a daydreamer and sensitive. In other words, like real people, these kids have dimension and a fullness of character that you don't often see in television, let alone animated kids' shows. And, of course, there's always Ms. Frizzle. She's who I wanted to grow up to be (and I feel that to some extent I have succeeded). While she's certainly a colorful character, and it's easy to think of her as a plot device to keep the show moving, what I find most interesting about the Friz isn't her incredible wardrobe of themed dresses, her intense sense of irony when choosing field trips, or even her near godlike omniscience, but rather her motto: "Take chances, make mistakes, and get messy!" I mean, seriously, can you think of a better motto than that? Especially for an educator to be constantly spouting? It's a really simple sentence, but I honestly feel like Ms. Frizzle's motto is genuinely profound. Take chances. Make mistakes. Get messy. These are all aspects of living a good life, a real life. And Ms. Frizzle makes it abundantly clear that not only is risking failure absolutely worth it, it's also frequently the only way to succeed. After all, if you fail, that just means you learned something about how it doesn't work. And that's often much more valuable than getting it right on the first try. 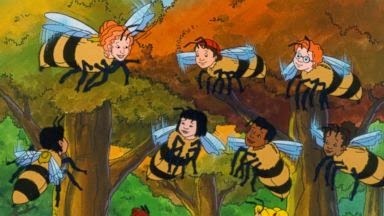 I think in a lot of ways, The Magic School Bus served as an antidote for me. It was the complete opposite of the school I was actually attending at the time. While said school, which shall remain nameless, was lovely and gave me a very good education, it didn't teach me how to live like this silly little show did. My school was all about rules and authority and learning the facts because those are the facts we tell you. And that has its place. But Ms. Frizzle's classroom was all about learning by screwing it up. Doing the worst thing possible and figuring out how to use it to your advantage. My school taught me what the scientific method was. Ms. Frizzle taught me why it was worth knowing. There's a difference there, and it's a big one. Now, I'm obviously not suggesting that instead of elementary school science classes we should just have everyone watch episodes of The Magic School Bus. I'm not saying that. What I am saying is this: Getting kids excited about science takes more than just telling them facts. If you want a child to want to learn something, and it seems increasingly that we do want our kids to learn science and go into STEM fields, then you have to help them understand why it matters. Maybe that's through a silly educational show. Maybe it's by helping your kids do wacky science experiments at home. Maybe it's something else entirely. But it is something. As adults we have a responsibility to make sure that kids understand the world they live in. Not just because we want them all to grow up to be scientists and software engineers and doctors, but because we want them to know who they are and what the world is made of. We want our kids to know how the world works and why the sky is blue and what happens when stars explode. It matters that they know that, because it matters that they wonder about it. Kids naturally do wonder about that, for the record. It's not such a stretch to figure that they'd like to know you wonder about it too. For me, watching The Magic School Bus and having parents who eagerly answered my fifteen kajillion questions about the world didn't lead to a career in the sciences. That's just how the cookie crumbles. But I do know that knowing this stuff makes my life richer. It makes it more worthwhile. And it makes it more exciting. Ms. Frizzle might be fictional, but I'm pretty sure she's the best teacher I ever had. Also possibly a Time Lord. *This is the worst day ever and I am very sad about this. I love bread so much. So. Much. I loved this show as a kid!! :D I used to watch it all the time! :) And now that I look back on it, it is also very feminist friendly too! :) I wish they'd make more shows like this. For the record, as someone who studies education professionally, I tend to agree with you about the value of curiosity and interest. You know, The Magical School Bus was the show I absolutely loved as a child, but then didn't think about it much after it stopped airing. I literally did not give it much thought, until I read this piece. 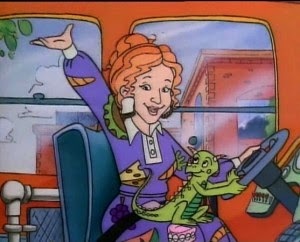 But I agree, Miss Frizzle was one of the best teachers I ever had, and I, too, remember the episodes. I remember when they explored the body, when they went into a wire and explained electricity, etc. You're also right about how all the kids were wonderfully developed. Thinking back, Arnold was a huge deal for me, because he was very much like me. I was and still am very anxious-if something goes wrong, I wish absolutely and utterly that I had stayed home. But even though Arnold knew that the field trips were going to be crazy and even scary, he still always went and explored and learned and was the better for it-even if the anxiety did not go away, he could deal with it. The message appeared to be, "It's okay to be afraid, but don't let that stop you" and that was very important for me to hear. This show was really great and I hope it stays on Netflix, because I will definitely be showing it to my children someday. I really like Arnold as a character. Just the idea that we give the wimp center stage and emphasize how he goes even if he always gets uncomfortable, because he gets more out of going than not. I also love that he's super into Wanda, who is utterly fearless. The characters are really well done. Your self-teach locale may even offer free online paper help classes that will enable you to graduate early. valid 500-230 exam QuestionIt’s very excellent information and more real facts to provided that post.Thank you for sharing this information.